His wife is beautiful. She’s charming and fabulous and the envy of the PTA. “I don’t know how she does it,” echoes in her wake as she works full-time and manages the monthly bake sale and volunteers for the garden club and sends 28 homemade invitations to her little one’s perfectly planned and executed birthday parties. Her husband is That Guy – the one everyone loves. The guy who, at 40, is in the best shape of his life. The guy who, after cashing out of the business that he and his buddy started in their college dorm room now teaches classes at a local college and writes a blog that all the students follow. No one knew that life behind closed doors can sometimes be hard. They didn’t know that his wife was diagnosed with a laundry list of DSM acronyms when she was 16 or that throughout her life she has searched for comfort and balance. That sometimes, neither was anywhere to be found. They didn’t know that as hard as her life can be, she wouldn’t change it. That after years of heavy medication had succeeded at keeping her more dramatic sorties into the extremes of her existence in check, she found that some of her more fundamental attributes had disappeared along with them: her creativity, her yearning for beauty, her unique expressions of joy. They didn’t know how much she had wanted them back. He’d never asked. Having seen her struggles, it seemed obvious to him that if given a choice she would want things to be different. There’s no one left who doesn’t know her story now. Because one day, her husband, that guy whom everyone loves, couldn’t take it anymore. He needed a place to vent, to find community. He needed people to understand how much his wife was, as he saw it, suffering. He needed to get help for her, and for himself. He logged onto his blog and wrote an open letter. I love my wife so much. More than life itself. There is nothing I wouldn’t do for her. But I am tired and lost. I don’t know how to help her. My wife deserves a cure. Along with the letter, he posted a photo. One he’d taken of his wife when she was sobbing and raging and feeling desperately out of control. One that shows her with matted hair and a tear-streaked face wearing pants stained with menstrual blood. It had been the lowest moment of her life. She’d never been more ashamed, more embarrassed, more remorseful. It was a moment she would do anything to forget. But that’s exactly what he wanted them to see – that moment – so that they would understand how bad it gets. When the post hit the Internet, comments came pouring in. Husbands in similar situations thanked him for telling their truth. They were oh so grateful to know that they weren’t alone. “I guess he needed to feel less alone, mom,” she said. She had no answer. No one had asked her what she thought. Her own story wasn’t hers anymore. The post ran through the PTA like wildfire. As soon as she hung up with her mom, the other calls came. They appreciated her help, but they had someone else who could run the bake sale. The garden club no longer needed her help next weekend, but thanks. Susie wouldn’t be able to make it to the birthday party. Finally her boss called. She’d been relieved of her job. The darkest, scariest, most intimate moment of her life has been documented and exposed. She has no secrets now. She has no privacy now. Her peers – her kids’ friends’ parents, sneer at her with disgust. “She had PERIOD BLOOD on her pants,” they stage whisper as they pass her on the school drop-off line. This is what I want to know: Are we okay with a husband taking a photo of his wife at the lowest moment of her life? Are we okay with him taking to the Internet to share his angst about this intensely private thing without knowing how she feels about it? Are we okay with him sharing the photo online, thereby not only jeopardizing her current job but making it pretty much impossible for her to get another one? Are we okay with him revealing to everyone who knows her that she couldn’t even take care of her most basic and private bodily functions? Are we okay with one solitary thing that happened in this scenario? Why are we okay with a parent taking a photo of their autistic child in the middle of a meltdown, their lowest moments? Why are we okay with sharing our children’s most private details without knowing how they feel about them? Why are we okay with jeopardizing our children’s prospects of getting or keeping a job someday? Why are we okay with talking about our children’s most basic and private bodily functions online? There was a time that I didn’t get this. A time when I shared too much. So I ask not you, but all of us ..
Why are we okay with this? The imaginary husband’s description of his wife’s experience is not meant in any way, shape, or form to serve as a representative description of life with mental illness. Rather, it is patterned after posts shared regularly by parents of autistic children. While autism is not a mental illness, I have seen far greater harm come from loudly delineating the differences than I do in joining forces to fight the stigmas and attendant societal challenges that both communities face. If you think this parallel fails because the wife has speech and the ability to read while many of the children about whom this type of information is routinely shared apparently do not, I ask you to read this. And then read it again. Editor’s note: Thank you, from the bottom of my heart, to the Autistic friends who helped me to rewrite and refine this post and, far more importantly, who have taught me that protecting my child’s privacy and dignity is everything. I love this! I didn’t get this at one point either. Now I do. Because of you, my children get asked before we post pictures of them. 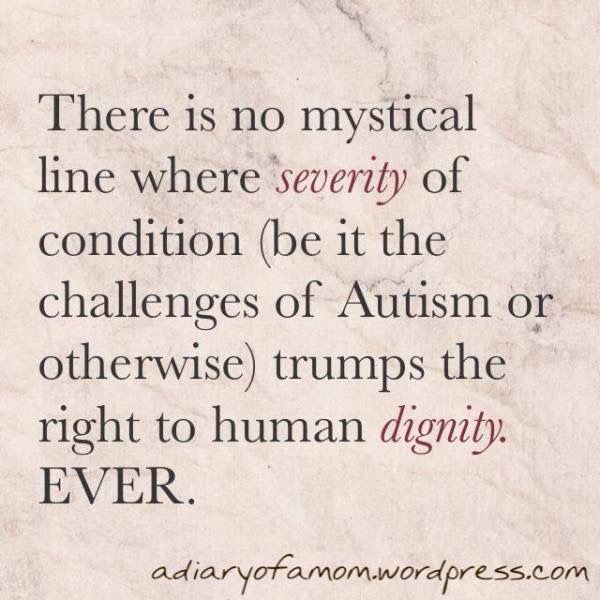 It is the right thing to do no matter who your child is or what they “suffer” from. Anxiety, depression, eating disorders, or just every day tough situations should not be shared. There is a better way to educate people. Thank you for this!!!! This had to be written. Bravo, Jess! De-lurking to say: this is one of the best posts that you’ve ever written and you’ve written many great ones. Bravo. Thank you, Tara. I appreciate it very much. i wish we could put this on the cover of the New York Times, The Boston Globe, USA Today, (you get were Im going here). This may be the best thing I have ever read, and I usually say that about all your posts. But. This. Yeah. THIS. What about a not perfect woman? A very imperfect woman with behaviors and issues that are troubling many people? Perhaps she doesn’t respond to greetings, says inapporpriate things at times. She’s out of the norm and upsets people. Perhaps some explanation of issues that might explain some of the behaviors and how one can help, reminders of what the ADA covers, how far we have come and she has in dealing with these things could help. The other terrible situation that exists is that children with certain behaviors and handicaps are at a much higher risk of being abused, mistreated, killed even. If some sharing of the issues that are out there resluts in some venting, some help, even if it’s assurances, cyber hugs, messages, referrals, links, that could help, maybe save a child, one wonders. Things are not so black and white. Actually, I do think that respecting our children’s right to privacy and dignity is indeed black and white. I also believe that the attitude that allows us to share these things with impunity is a dehumanizing one and ultimately jeopardizes their safety. That said, I do believe, as I’ve said numerous times, that sharing issues, venting, getting referrals, links, etc can be very helpful things and the great news is that one doesn’t have to compromise their child’s privacy to do any of it. I think things are more important in life, hope you never have to contend with them that are more important than respecting rights to privacy and dignity. No, it’s not always black and white. Sometimes it’s not a matter of taking the high or low path, but which low path to survive. I fear this will sound terribly defensive, but having just walked with my dad’s wife through her last days on earth, and preserving her privacy and dignity throughout, up to and through her death, I find it hard to feel like I haven’t contended with what’s important. I have found that respect for a human being and acknowledgment of they’r humanity is even more important than ever in their worst possible moments. As for the first part of your comment, all of that is VERY, VERY different than the scenario that was purposefully presented here. There are myriad ways to present that information without this kind of betrayal of trust, privacy, and respect. I gave the scenario as it is more like that of the scenario that you are making an analogy to, IMO. I have read all of your posts, I enjoy them, and understand the points you are making. But I did not think this was an apples to apples comparison. It missed a number of important points in real life situations when things are not ideal and maybe quite precarious. I agree completely that it’s not apples to apples. Nothing really could be, I think. I viewed it as an attempt to get people to think about how they might feel in what is the most similar situation I could conjure. It’s absolutely a flawed comparison, but I believe it’s a relatively good vehicle for understanding, on a more personal level, the issues around privacy. I would go one step farther. Given the way nothing ever, ever disappears from the Internet. it is better simply not to post that which is not fully yours. Even if you ask a child whether it’s okay to post a photograph, don’t we disregard childish requests for their greater good on many other issues? I can’t see why getting consent from a child — someone who often would say “fine” just to please the parent — makes it okay to put something out there that will never disappear and the future effects of which can only be guessed at, but are not likely to be positive. I can’t agree more that a child’s consent is only one step in the process of determining whether or not a photo or story should be posted. Parental judgment HAS to be a part of it. That said, I do think there’s something to be said for asking the question once you’ve (as a parent) deemed it appropriate / safe etc. For me, it’s an important way to show respect, and to let my children know that they ALWAYS have a choice NOT to share. One that they exercise a fair amount. I had a news write about me without my permission. It was aggravating with I “suffer” autism. The only “suffer” of it is that ignorant people are mad at my way of speaking. I am happy at you for letting your daughter speak. I just found your blog a short time ago. First of all, love it. Thank you. I hear you through this post. I truly do. However, I’ll present another side. I have a 14 year old son, diagnosed with autism at the age of 2. Nonverbal. By diagnostic standards, as severe as a kid gets, not my words, but tough to dispute (perhaps impossible?). You and I agree on so very much. In fact, as I read through your blog, our thoughts and feelings and actions at many times are eerily similar on many topics. I respect you without even knowing you. I also write quite a bit. While my neurotypical 11 year old daughter approves anything I post about her, I have posted plenty regarding my son that he has not approved. He doesn’t communicate as well as your daughter (not even close), but truth by told, I haven’t even attempted to ask his permission. That being said, I share dark moments without ever risking his humanness or dignity. I am not a victim, ever. My love and advocacy for him is always, unequivocally obvious. I hear you. I do. However, some really great things have come from my writing. Awareness. Help. Support. Love. Understanding. I am regularly contacted by other parents with kids similar to my amazing son. We need each other. 1. Kids who communicate very well, and have minimal regulation issues. 2. Kids who communicate fairly, and have minimal regulation issues. 3. Kids who communicate well or fairly, and have major regulation issues. 4. Kids who communicate very little and have extreme regulation issues. Now I realize we could come up with a million different categories, but just stick with me here. I have a point, I promise! Across all and any categories, there will be similarities and differences, as with all humans. There is a category, and I’d bet large amounts of money that it is the tiniest of possible categories. It’s the tough nuts (all would be in #4 above, but not all of #4 would be tough nuts). We are on our own tiny island. Even within our own commmnity, our situations are not realized by most. When “the best of” the autism community is fighting for what is needed, our needs aren’t covered. In fact, not even imagined. Nothing intentional, we are simply such a small percentage – we are the cancer that only happens to 300 people per year. We need a voice. We are at the very early stages of awareness. We are still trying to simply convince people we are here! So, some of us need to find a way to explain what makes us so very unique, even within our own community. Some of us have to share that at one point all the windows in our homes had to be boarded up for safety, and many other dangerous realities. We are madly waving our arms in the air screaming, “Hey, guys! We are here! Don’t forget about us!” We need to be realized before we can be helped. Without sharing our reality, how else can we become known?